Domains: Continuous. Size: 2-D. Kind: Iconic Diagrams (2D Planar). 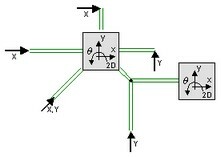 Any number of connections can be made to the TwoDBody model. All forces acting upon the body are added. Because any number of connections can be made, successive ports are named P1, P2, P3 etc. 20-sim will automatically create equations such that the resulting force P.F is equal to the sum of the forces of all connected ports P1 . Pn. The velocities of all connected ports are equal to P.v. The model has a preferred velocity out causality. The corresponding constitutive equations then contain an integration. The model can also have the non-preferred force out causality. The constitutive equations then contain a differentiation. Port with three degrees of freedom (x, y, q). Any number of connections can be made. • A TwoDBody model can be connected to any other element of the 2D-library except other 2D-bodies. Two bodies can always be simplified to one TwoDBody model with the combined mass and inertia of both single bodies.